2017 was a big year for us here at Miller Wine Works! Our 2013 Zinfandel won a gold medal in the California Zinfandel Competition. 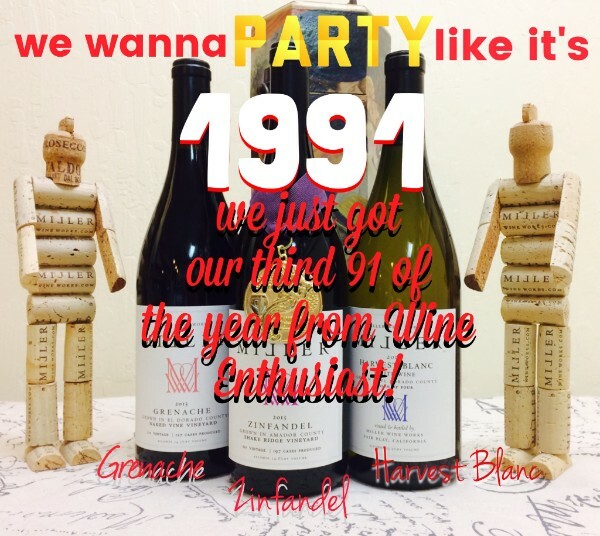 On the heels of that award, Wine Enthusiast magazine had us saying "You like us, you really like us" by scoring our 2012 Harvest Blanc, our 2013 Zinfandel and our 2014 Grenache all with 91's! We are on a roll and we can't wait to top ourselves in 2018 with more Wine Club Exclusives, events and by celebrating our 4th year of partnership with Sutter Creek Cheese Shoppe! Thank you for your support through the years! You sure can! Just because you put your summer clothes away doesn't mean you have to quit "Rosé All Day", in fact, Rosé wines with heartier varietals like our very own Ruddy Bloom Rosé, withstand the changing seasons quite well. So don't shy away from a bouquet of Rosé for your Valentine sweetheart. We've even made it easy for you by making some gift baskets with Rosé and accompaniments so you don't have to sweat the details. Have you met the Nouveau? If you haven't experienced the floral and fruity beauty of the 2017 Zinfandel Nouveau, you are not too late to experience it. Not only is this wine still available in every tasting room in town but Wine on 49 have scheduled some Nouveau-centric events just for you, stay tuned for dates and times. Valentine's Day is just around the corner and we know how stressful picking the right gift for your sweetheart can be. 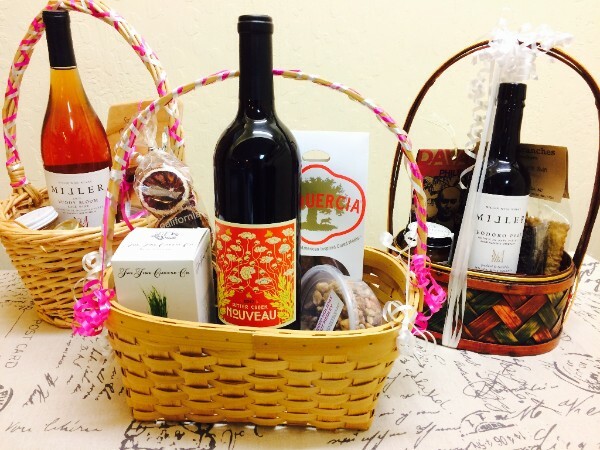 That's why we have put together some beautiful gift baskets featuring the Wine on 49 Nouveau and of course out very own Miller Wine Works Ruddy Bloom Rosé and Teodoro Port. These baskets are filled with the perfect accompaniments to the featured bottle and won't cost you an arm and a leg. You are already giving your heart away, after all. It's almost that time again! Wildflowers & Wine is back on Sunday, April 8, 2018. Tickets aren't available yet but stay tuned here for details about what Miller Wine Works has to offer this year to the festivities. We are excited, are you?